On February 23rd, 2017 Architectural Digest magazine posted this article on their website, “A Glamorous New York Apartment Pays Homage to Its Art Deco Past,” which is about our Fifth Avenue Apartment renovation project that we designed with Ernest de la Torre. Fan Winston wrote the article and the photography is by Richard Powers. 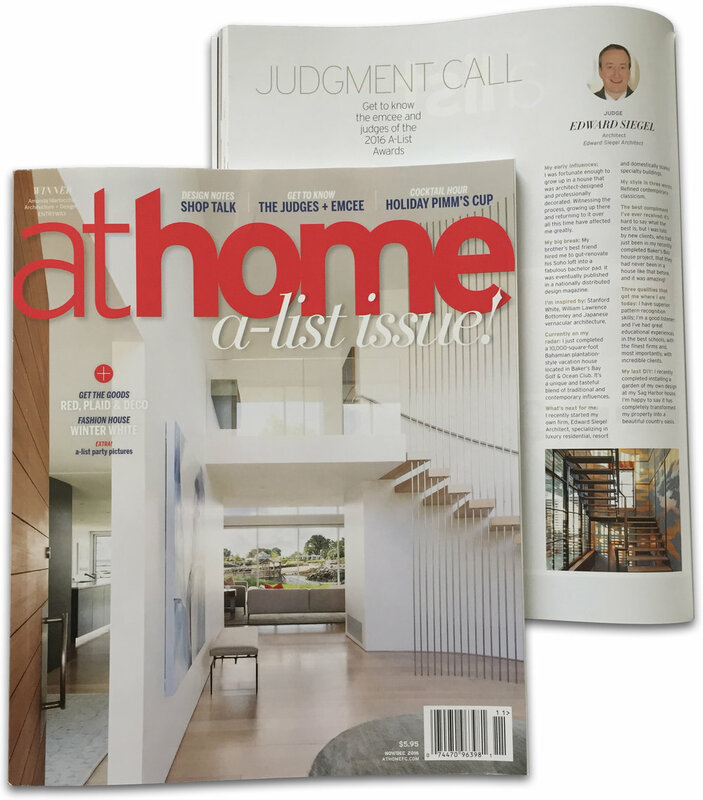 Athome magazine of Fairfield County interviewed Edward Siegel, who was one of the judges for their 2016 A-List Awards. This is his third successive year having been asked to judge their prestigious annual design competition. The interview appeared in their November/December 2016 A-List issue and the article is entitled, “Judgement Call.” Although the article doesn’t appear online, pictures of the event do. Our Upper East Side Penthouse renovation project was featured in the June-August 2016 issue of New York Spaces magazine. The article, “Blue Man Groove,” was written by Jorge S. Arango, and Peter Murdock was the photographer. Ksenija Pavlovic, the Editor-in-Chief of her online media hub: The Pavlovic Today, interviewed Edward Siegel for her article titled, “New York Chic of Edward Siegel.” It appeared online on April 10th, 2016. Our Private Library renovation design was featured as part of this Soho loft renovation project article in the New York/Winter 2015 issue of Luxe Interiors + Design magazine. The article, “In the Pink,” was written by Jorge S. Arango, and Peter Murdock was the photographer. We were both surprised and thrilled to find our project pictured in Architectural Digest magazine’s full-page advertisement for their Home Design Show in the March 19th, 2014, Sunday New York Times. We were thrilled to have our Soho Loft project featured in the August 2013 issue of Architectural Digest magazine. The article, “In the Mix,” was written by Rob Haskell, photographed by Pieter Estersohn and produced by Howard Christian. Our Parish House project for St. Luke’s Episcopal Church in East Hampton, NY was featured in the December 2012 issue of Traditional Building magazine. The article, “Village Addition,” was written by Annabel Hsin, and Robert Benson was the photographer.